Bio-Clean will naturally "eat away" at the grease, food, hair, soap film and all the organic wastes that tend to clog peoples drains and piping. Safe drain repair cleaning and pipe maintenance and safe for the family. BUT WHAT IF THERE WERE A PRODUCT THAT NOT ONLY REMOVED THE CAUSE OF THE PROBLEMS, BUT DID IT IN A SAFE, EFFECTIVE AND ECONOMICAL MANNER?! THAT PRODUCT WOULD BE BIO-CLEAN! 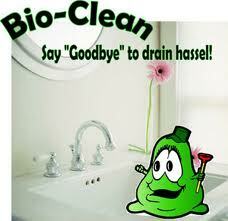 Russell B Bleakley Plumbing & Heating, Inc. is a National Distributor for Bio-Clean! Bio-Clean will Naturally "eat away" at the grease, food, hair, soap film and all the organic wastes that tend to clog peoples drains and piping. Safe drain cleaning and pipe maintenance and safe for the family! 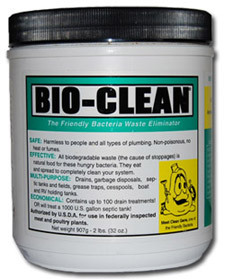 ​Bio-Clean is a blend of bacteria and enzymes. The bacteria are natural, not genetically-engineered. • Eliminates costly compensation to employees that have been injured by using dangerous chemicals. ​Most septic systems in operation today are not functioning well. The tanks need pumping frequently because of solids build up. All too often the fields stop absorbing water prematurely. The number one reason is the vast array of household chemicals which either inhibit or kill biological action. The coliform bacteria normally present in sewage are in no way equal to present day demands. They are used to warm body temperatures and are poor enzyme producers. They cannot handle synthetic materials present in detergents even under the best conditions. ​People on a septic system must select their cleaning products very carefully. Mention an outhouse and the first thing that pops to mind is ODOR! BIO-CLEANturns the waste into water and carbon dioxide very quickly. This dramatically reduces odor and flies. Cleaning and disposal of the pit become easier and it is more pleasant for the user, too. ​As the waste water level increases in the tank some scum adheres to the sides and sensor. When the tank is drained, more scum is deposited. With continued use, this coating becomes odorous. It is additional weight and reduces tank capacity. There is no large access to the tanks and the build-up is so great that clean-up is difficult and time consuming that replacing the tank is often less expensive!